We are the heating & cooling experts you trust! Here at Home Heating Service, Inc., we understand how important it is for our customers to know that they can rely on us. We pride ourselves on being the most dependable heating and air conditioning team in the Colorado Springs region. Not only do we go above and beyond during all of our service calls, we also work hard to make sure our prices are always competitive. Our focus is on providing our customers with a wide variety of HVAC services, from heating and cooling to air filtration to water heater repair and beyond. Our NATE-certified technicians are available around the clock so that you always have help when you need it! Supporting the Community Through Warm Wheels Project, and others! From a new energy-efficient heating installation to unbeatable repair and maintenance services, Home Heating Service, Inc. is here to help keep the heat flowing in your home all winter long. Our full-service team of NATE-certified technicians is trained to handle anything that your home’s heating system can throw at them. In emergency situations, we offer around-the-clock scheduling and we are available during regular business hours for consultations and estimates. We offer free new equipment estimates to our customers to go along with flexible financing options on approved credit. With Home Heating Service, Inc. by your side, you’ll never have to deal with furnace problems alone again. 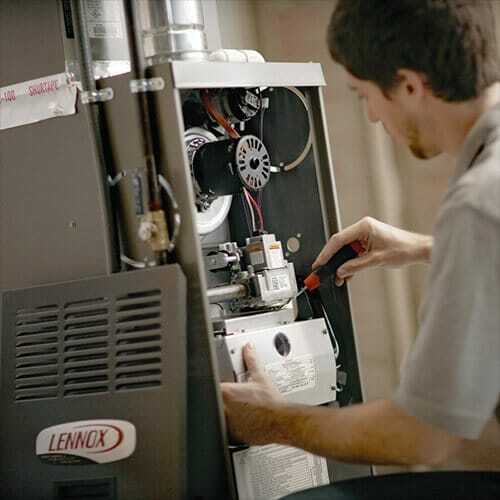 We Work on Furnaces, Boilers, Heat Pumps, and More! We Do Fireplace Maintenance Too! We treat our customers and employees as we would want to be treated. We have a commitment to professionalism. We believe in superior customer service! We participate in the Warm Wheels Project, Lennox’s Feel the Love Program & many more. When the summer heat starts to climb and you have trouble with your AC system, call Home Heating Service, Inc.! We service all air conditioner makes and models plus evaporative coolers and ductless systems too. All services are be performed by a licensed technician and our work is backed by a customer satisfaction guarantee! Turn to us for all your Colorado Springs cooling needs, and remember we offer 24/7 service in case of emergency! In addition to the traditional repair and installation services, Home Heating Service, Inc. offers all types of home comfort solutions! We offer indoor air quality products and services like duct cleaning and duct sealing. Our home upgrade solutions range from insulation services to home energy audits. And if you are building a new home, our new construction HVAC services are second-to-none. We also offer our Comfort Club program that makes it easy to keep your heating and air conditioning system running like it should! No matter what type of heating and cooling service you need here in the Colorado Springs area, you trust Home Heating Service, Inc. Make us your go-to HVAC service!